Bob Beisbier, Registered Home Inspector and Certified Master Inspector (CMI), serving the Milwaukee, Waukesha, Oconomowoc, and Mukwonago areas. In fact, I cover all of the 10 counties in southeast Wisconsin. I take the Home Inspection process very seriously! Of course it’s my livelihood, but it’s one of the biggest purchases you will ever make. A good Home Inspection by a licensed Home Inspector matters, whether you are buying a new home, selling your existing home, or need me to take a look at a certain aspect of your home such as energy efficiency, water damage, or other issues in your home. You’ll find I’m a great resource for information and an excellent independent opinion when you need one. You found your dream home. Do you know what you are really buying? I’m a Certified Master Home Inspector so I’ll be happy to take you through the home in detail. Follow me around your dream home for a home inspection and I will point out defects major or minor (if any) you will need to address before closing on the property. More importantly, I will give you great maintenance tips on how to keep your home safe, healthy, and secure. I will also give you an idea of the lifespan of each of the major household systems (furnace, air conditioning unit, hot water heater, etc.) and how long before they will need replacing. As we view the property, I will fill out a detailed home inspection checklist of what is serviceable and what may need attention. At the end of my evaluation of the property we will go over the computer-generated complete report in detail to make sure you understand everything before I leave the site. My pre-sale home inspection report is an excellent tool when putting your home on the market. It allows you to address any issues before a potential buyer finds it, and allows you to substantiate your listing price. I’ll take a look at you home and help identify areas where you could be losing heat or needlessly increasing your energy bills. I”ll even give you great tips on saving money around the house. Air quality is so important for you and your family. I have the tools to measure your air quality in your home and can help you find ways to resolve any quality issues you may be experiencing. I can help with so much more. Click here for a full menu of all our home inspection services click on Services at the right. Milwaukee Home Inspection: Give me a call. 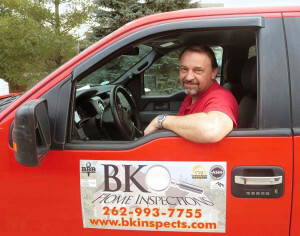 When you call BK Home inspections, you will talk directly to Bob, Certified Master Home Inspector. I will be there for you and your home from start of our Home Inspection to the finish and beyond! I invite you to browse through my website for lots of great information and links to important websites. Don’t forget to read my free timely tips. Sign up for my monthly newsletter Timely Tips for Homeowners, which is full to hints and information for homeowners.